5KCBWDAY1 – A Day in the Life of…. erm…? 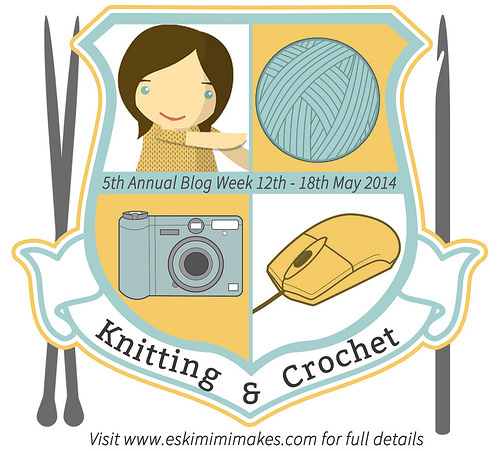 So it’s the first day of Knitting and Crochet Blog Week 2014! Want to take part yourself? You can find all the details here on Eskimimi Makes, there’s a post on the daily topics here and a post on the tags you need to use in your posts here if you’re interested in joining in. Last year it was a lot of fun and I certainly learnt a lot, even if I deviated from the post topics a little bit and put my own spin on them! I never was very good at following the crowd. You can read last year’s posts here. Today’s topic is ‘A Day In The Life’ of a project you’ve made or are in the process of making. a) I think you probably don’t really want to read about those days and mostly I want to just put it behind me rather than write about it. b) Even if you do want to read about that, I don’t really want to write about it on the internet – and as this is my blog, I’m the boss 😉 – sometimes the internet encourages you to overshare and I want to avoid that. So in the spirit of honesty and being candid I need to come clean about today’s topic. You should probably know that my immediate reaction to this topic was a silent, internal ‘arrrrgh!’ that only I could hear. Also, I’ve spent a considerable amount of time staring at a blank screen or reading everyone else’s blog posts for the day, hoping for inspiration to hit me. It hasn’t. Or it sort of has, but I can’t decide if it is tolerable, dreadful, or quite good. I hope it’s the latter, but I don’t know if I’m brave enough to post it and find out. Indecisive as usual (a recurring theme in my posts from last year). I could write a day in the life of a project I wear frequently (most likely a shawl – maybe this one that I finished recently)…. The wardrobe door is flung open and I’m pulled unceremoniously from my comfy resting place on top of a pile of knits on the top shelf. Lottie has to remove me in this way as she can only reach me on the high shelf by standing on her tip-toes with her arms at full stretch (she’s only 5’3″), so I’ve got used to it. Lottie doesn’t always plan what she’s going to wear until she opens the wardrobe so I never know if it will be my day or not. Quickly flung around her neck, a brief glance in the mirror on the inside of the wardrobe door confirms I’m not going to slip off. I’m rudely shaken about as she leans heavily on the uncooperative wardrobe door in an attempt to close it. More often than not it pings open again after she’s turned the key and we repeat the process (If she doesn’t turn the key exactly the right amount clockwise we’re snookered). I know that this is because she’s got too much yarn in there, but I’ve not plucked up the courage to tell her yet. Then I experience the exhilaration of having to hold on tight as she rushes down the stairs and out of the house. Once at work (at Stash Fine Yarns) I get blown about in the breeze as she takes the shop sign outside, ready to tell all the other knitters that the shop is open. I try my best to stay securely wrapped around her neck while she picks orders, answers the phone and helps customers, but sometimes I lose my grip, or I get cast aside on warmer days. Sometimes I get used as an impromptu hair covering in the rain because she hates it when her hair goes frizzy in the rain (having straightened it out of it’s natural curly state). I don’t like this part. At. All. But I’m not just a shawl, I’m a badge of honour, helping Lottie (who doesn’t really look like a stereotypical knitter) to prove that she knows what she’s talking about and that she is a knitter too, just like the customers. Sometime I even get compliments from them! If I had a blood supply I would blush. I’m a comforting presence, a piece of armour against the world, part of the unofficial uniform of ‘clothes for work’ that helps her to feel professional and more confident (she’s quite shy really). 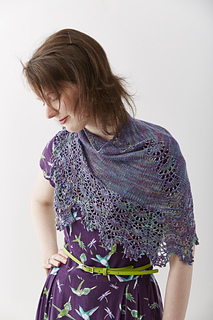 Sometimes at the end of the working day I’ll have the opportunity to internally roll my eyes (if I had any – mind you, I’m a lacy shawl, so maybe I could roll my eyelets?) when Lottie buys yet another ball of yarn, knitting book or pair of her favourite Addi Premium circular needles (why she needs another pair I don’t know, as she must have plenty already, but I suppose they’re probably holding another WIP, perhaps one that will join me on the wardrobe shelf in a few weeks?). Then it’s back home and into the wardrobe until the next time. Just as soon as she’s got that door closed ;). Wouldn’t that be a bit… dull? I seem to have written a blog post by accident. Yes, sometimes I write my best posts when I accidentally write something I wasn’t expecting to.